Macron’s European vision is inspiring, but he cannot realise it without Germany. The French president is reforming his own country and wants to relaunch Europe. But where are his partners? France is back: vigorous, lucid, ambitious. Hurray. But who else is there to help Emmanuel Macron get Europe going again? Italy is having a nervous breakdown, Spain weighed down by trouble at home, Poland throwing a massive wobbly, Britain hovering near the exit and Germany slumped on the sofa. Talk about a dysfunctional family. Let’s dwell for a moment on the good news, before turning to the bad. Macron is spelling out a coherent vision for reviving Europe, while briskly proceeding with long-overdue change at home. One year into his five-year term, he has used his parliamentary majority, and the extraordinary power of the presidency created by Charles de Gaulle, to push through a whole raft of domestic reforms. His government is considering what Le Figaro calls a ‘vast programme’ to cut public spending by around €100 billion over the five years. Here in Paris, train strikes make getting about a little bit more complicated, but the inevitable protests have so far been modest by French standards. If the Eurozone economy keeps growing – and with the Italian crisis, that’s now a bigger if – France could not only have more growth but crucially, more jobs. Meanwhile, he has spelt out a compelling vision for the future of the European Union, in a carefully composed suite of grand speeches delivered in Athens, in the European Parliament, at the Sorbonne, and on receiving the Charlemagne Prize in Aachen, where I heard him at first-hand. I find his combination of historically informed lucidity, strategic ambition and personal passion hugely impressive. Compared with the admittedly thin competition among political leaders in Europe, indeed across the West, this physically small man is our only giant. His starting point is bracingly realistic. Against the habitual Brussels cliches, he insists that we have not actually had 70 years of peace and freedom in Europe (think former Yugoslavia or Ukraine) and that everything we have achieved is now under threat. We cannot afford ‘the luxury of forgetting’ what prior generations of Europeans have been through. If we’re not careful, we will again sleepwalk into tragedy. Therefore what we need is ‘European sovereignty’. This, his central idea, cleverly claims the term sovereignty back from Eurosceptic sovereigntists such as French Front National leader Marine le Pen and English Brexiteers. What he means by it is the power to defend our shared interests and values against internal threats from nationalist populism and external threats from Russia, China, climate change, mass migration and digital revolution, not to mention Donald Trump. In a world of giants, Europe must be a giant itself, or we will be separately and severally trampled underfoot. And we must not cower before the oncoming juggernauts. Courage, fellow Europeans, courage. You need not agree with every concrete proposal for Eurozone reform to applaud his larger vision. The trouble is that he can’t do this on his own and currently has no one else to do it with him. The most urgent problem is Italy, the most important is Germany. With the Italian crisis, all the inherent problems of a halfway-house Eurozone are again on display. In theory, this should strengthen Macron’s case for Eurozone reform. In practice, it will strengthen Germans’ self-righteous determination not to have ‘our money’ used to bail out feckless others. And Angela Merkel is doing nothing to lift her compatriots off their sofa of complacency. Talking to senior officials in Paris, it is clear that Germany is their biggest concern. The whole build-up to the Charlemagne Prize ceremony in Aachen was about an ‘eagerly awaited German answer’ to Macron, but answer came there none. Merkel’s speech in honour of ‘dear Emmanuel’ was so short on strategic response that it felt little short of insulting. One of Macron’s many virtues, also said in his address to the U.S. Congress, is that he is not afraid of openly articulating differences. He has the courage of his convictions. So in Aachen, having explained how France (‘dear Angela, I think you know this’) is tackling its own ‘fetish’ about public spending, he appealed to Germany to get over its ‘perpetual fetishism for budget and trade surpluses’. The mainly German crowd applauded dutifully. I looked across to Merkel and I reckon she gave about two perfunctory handclaps, maybe two and a half. 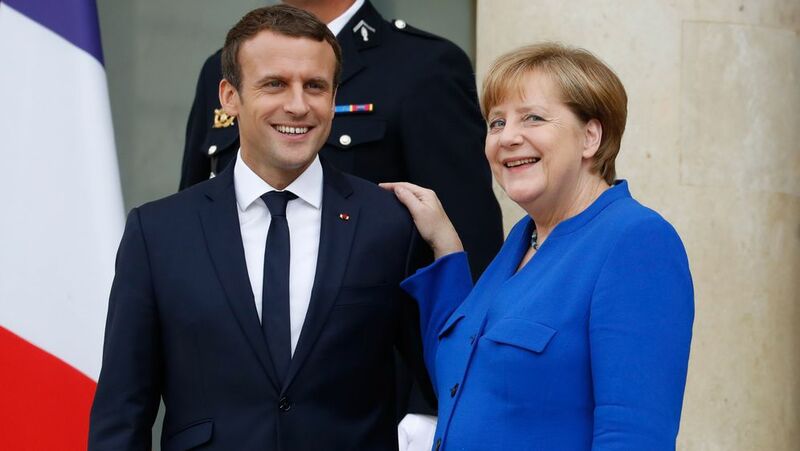 Far from converging towards a new Franco-German consensus at the European summit at the end of June, new divergences between Paris and Berlin have emerged. While the French president wants to give a firm, united EU response to Trump’s protectionism, Berlin is looking for compromise, in what one Macron adviser described to me as a ‘mercantilist’attempt to protect its own national exports. While France supports the tough line currently being taken by the European commission against a shocking erosion of the rule of law in Poland, Germany is again looking for a compromise. Some of these differences may yet come out in the inter-governmental wash, so we reach something that looks half-way like a common Franco-German strategy at the European Council in late June. If not, then Macron is seriously toying with the idea of appealing over the heads of his fellow leaders to voters across the whole European Union, in next year’s European elections. Quite apart from the practical difficulties of fighting elections in other people’s countries, the trouble with this bold idea is that, for all his great virtues, Macron is in many ways exactly the kind of technocratic, top-down, elite figure to which so many Europeans have developed a distinct allergy. Be that as it may, he is the best European leader we’ve got. If he fails, I fear not just for France but for the whole future of the European project. Germany, please take note.